London, Friday 30th November 2018 - On Saturday 8th December former two-time World Boxing Organization (WBO) World Champion Scott Harrison makes his welcome return to the ring, at the Glasgow Club in Bellahouston, Glasgow. Harrison (27-3-2, 15 wins via KO), who was released from prison in July after serving three years of a four-year sentence for assault in Spain, is set to face Ghana's Tackie Annan (11-6-0, 10 wins via KO) for the Professional Boxing Council (PBC) International Lightweight Championship. Annan's last visit to Scotland, back in October 2017, see the big punching Ghanaian knockout Aberdeen's Nathan Beattie in the second round of their PBC Silver International Lightweight Championship contest at the Beach Ballroom in Aberdeen. Without doubt the choice of Annan for his return fight, after so long out of the ring, shows the Glaswegian's determination to take meaningful fights in his quest to regain ranking for future World Championship accolades, as Harrison made clear when he spoke earlier today. "I'm really looking forward to the 8th December and getting back to work. I've not boxed in five years so it's going to be a terrific night and I can't wait. "I've not got a lot of time left, so I'm looking forward to enjoying the rest of my career and hopefully win the World title again. "To get in the position to challenge for my third World title I needed a good test on my first fight back, Annan's proved himself, he won ten of his fights by knockout, including against Nathan (Beattie) last year. "I'm in a good place mentally and physically, and I feel in good condition as well. I have had a full ten-week training camp, sparring has gone well and there haven't been any distractions, so now I am really looking forward to getting back to work on the 8th of December and putting on a good performance in front of all the supporters." 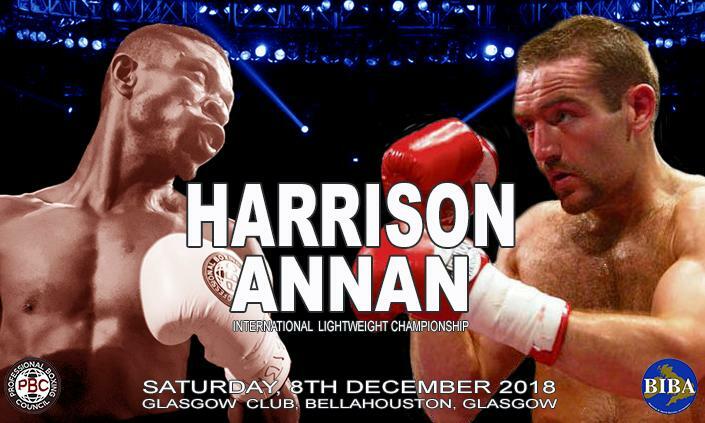 Scott Harrison versus Tackie Annan for the Professional Boxing Council (PBC) International Lightweight Championship takes place at the Glasgow Club in Bellahouston, Glasgow on Saturday the 8th December 2018.